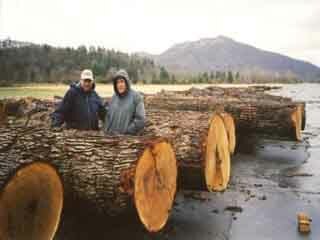 Since 1949 the Grist family has been involved in the acquisition and management of timber in West Virginia. We are proud of our heritage in the state and look forward to many more years of professional forest management. Let's now take a look at what goes into making a timber sale successful. The first step is very simple. Just think about all the wonderful values your forest provides and how you want to manage for them. These include timber income, wildlife habitat, clean air, pure water and also recreational opportunities. As registered professional foresters, we can help you make sound decisions concerning your forest. Once you decide how you want to manage your property, we then identify and mark the property lines. We try to meet with your neighbors and let them know the lines have been marked and answer any questions they may have regarding our plans (starting and finishing the sale, traffic, noise, environmental concerns and so on). After the property lines are marked, registered professional foresters begin "cruising" the timber. This step identifies the trees to be harvested. 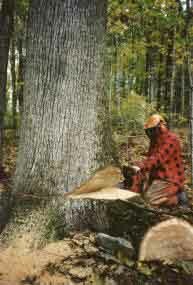 One forester measures the diameter of the tree at breast height (dbh) as the other forester determines the grade and number of logs in the tree. 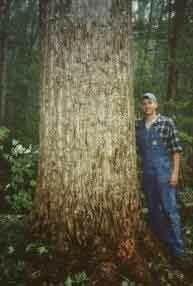 The tree is then recorded in a handheld computer by species, grade and size. This tree was marked with blue paint to let the timber cutter know it is to be harvested. The foresters also mark trees which may need special attention that will not be harvested, such as wildlife den trees or trees in sensitive areas near streams or wetlands.